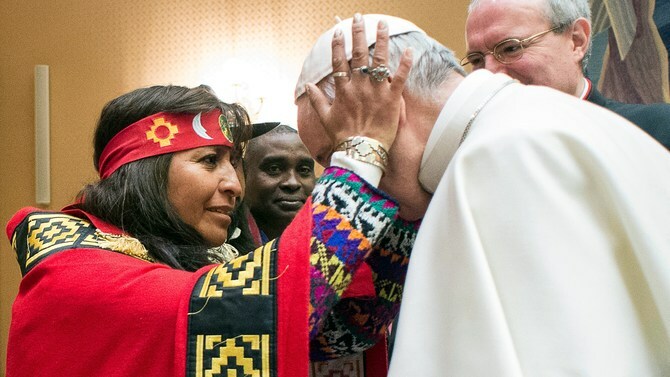 Pope Francis declared that Native Americans deserve the right to give prior consent to any economic activity that affects their ancestral lands. On Wednesday, Pope Francis attended the Indigenous Peoples Forum in Rome and defended the rights of indigenous tribes. The meeting was part of the UN International Fund for Agricultural Development, and Pope Francis addressed 40 representatives of the 300 largest indigenous groups in the world. During his speech, Pope Francis also promoted the full participation of indigenous peoples in local and national government. His insistence that indigenous groups must give prior consent to any economic activity affecting their ancestral lands clashes with action recently taken by the Trump administration. Even though the U.S. Army Corps under the Obama administration denied an easement to the parent company responsible for constructing the Dakota Access Pipeline (DAPL), Donald Trump signed an executive order just days after being sworn in which gives a green light to the project. Though Pope Francis did not cite the DAPL directly during his address, a number of media outlets were quick to pick up on his suggestion. The Vatican press office said he was not making a direct reference to the four-state pipeline which would potentially contaminate the Missouri river and uproot sacred burial ground of the Standing Rock Sioux tribe. “For governments, this means recognizing that indigenous communities are a part of the population to be appreciated and consulted, and whose full participation should be promoted at the local and national level,” Francis told the leaders on Wednesday.